High resolution images and broadcast quality High Definition Video footage of the lynx is available by request or at an interview. The Eurasian lynx is a solitary cat that haunts the forests of Europe. It is the third largest predator in Europe, after the brown bear and wolf. 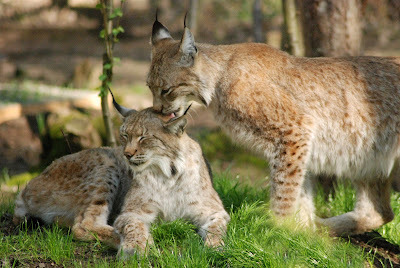 Lynx are covered with beautiful thick tawny fur with faint spots. Their large paws are also furry and hit the ground with a spreading toe motion that makes them function as natural snowshoes. They are about the size of a collie dog – far bigger than a domestic cat but smaller than the wolves. They have short black-tipped tails and long back legs for jumping. Their ears have long tufts to aid hearing. These stealthy cats avoid humans and hunt at night, so they are rarely seen. Lynx became extinct in Britain due to habitat loss and hunting for their fur. They have been absent from Devon for at least 1200 years. Wildwood Trust was formed in 2002 as a centre of excellence for the conservation of British wildlife, and to promote efforts to rewild Britain. Wildwood Trust took over the running of Escot Park in 2015 with the charitable aim of continuing the Estate’s objectives to promote wildlife education and conservation. As one of the leading British animal conservation charities in the UK, Wildwood Trust is dedicated to saving Britain's most threatened wildlife. Wildwood Trust has taken part in many ground-breaking conservation programmes to date, which include, saving the water vole, using wild horses to help restore precious nature reserves, bringing the extinct European beaver back to Britain and returning the hazel dormouse and red squirrel to areas where they have been made extinct. West Blean Woods is a very important site which can be documented back to medieval times and is a relic of the original ancient wild woods that once covered Britain. It is now part of one of the largest concentration of ancient semi- natural woodland and conifer plantations left in England. The forest complex is of national and international significance and has received the highest conservation designations, including Site of Special Scientific Interest, Special Area of Conservation and National Nature Reserve.